What is a bartender? That’s a good question that has many answers. Is a bartender just a person who serves drinks? Absolutely not. A bartender acts as a psychologist, comedian, a confidant, and most importantly a friend. Most bartenders have a very outgoing personality and love to be around people. Good bartenders possess incredible customer service skills. They anticipate customers’ wants and needs. A good bartender is also very resourceful. Because of the nature of the job, bartenders usually meet many people from all walks of life. Whether you are a doctor lawyer, accountant, dentist, or successful businessman, at some point in your travels, you’re going to end up in front of a bartender. Being a bartender is a great way to network within your community. A good mixologist takes pride in his or her job. They not only care about serving drinks to their customers but also care about the customers themselves. Why be a bartender? Another good question that has many answers. The number one reason to be a bartender is that bartending is a FUN job. Where else can you go to work and enjoy what you do without constantly looking at the clock to see how much time you have until you go home? Bartending is a profession where you are exposed to new people every day? This makes bartending very exciting. The best part of being a bartender is the amount of money you can earn for doing a job that you love to do. Most bartenders have an earning potential of twenty to thirty-five dollars per hour wages and tips combined. Why go to bartending school? Once again, a good question. Where else can you go to learn a new profession in one or two weeks and be ready to go into the workforce? Most bartending schools provide a tremendous amount of benefits to their students. 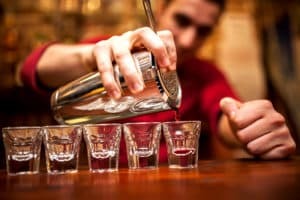 Most importantly, bartending schools teach students the skill of making all of those delicious cocktails that we all enjoy out at our favorite bars, restaurants, and nightclubs. Bartending schools also teach their students the art of giving personalized customer service. Good bartenders make each customer feel like they are the most important person in the establishment. The nicest benefit of going to bartending school is the job placement assistance that is offered to each student upon successfully graduating the program. Once a student has graduated, they may contact the school for current leads from establishments that are in need of hiring bartenders. Every graduate has the same opportunity for successful employment. Why Raleigh’s Bartending School? The instructors spent ample time with class as well as individual time with students who need extra attention. The goal at Raleigh’s Bartending School is to provide each student with the necessary skills to effectively go out into the workforce and make a good full-time or part-time income. Raleigh’s Bartending School builds confidence in each and every student. All students receive hands-on training. Upon graduation, most students from Raleigh’s Bartending School are able to work behind any bar and feel comfortable with their environment and confident in their abilities.